Gosh another month gone already, can't believe it's already July, I hope you are enjoying the summer. As it's the 1st challenge of the month that means it's a sponsor week over at CD Sunday and this week we are lucky to have The Stamping Boutique as our sponsor, they are offering a prize of 3 images of your choice to one lucky winner, so lets see your entries for Christmas over at the CD Sunday challenge blog. 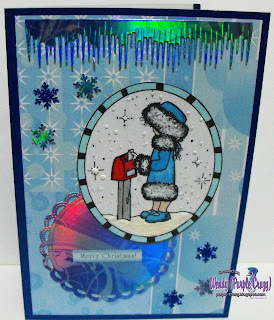 I chose to play with the Stamping Boutique digi stamp Mail Girl for my card and coloured her with promarkers and used flowersoft polar white on her fur trims, the snow is made with my puffy snow pen, clever stuff that ! my Stars & Globes BP is from the Crystal Dreams CD by Debbi Moore, the snowflakes were cut with an MS snowlfake punch and the circular die cut and the icicles border are both with Marianne Creatables (I just love their dies and i'm building up quite a collection now) from some Kanban patterened mirri card. So I can pop another Christmas card in my box. Thanks for looking. Love the fuzzy trim on her coat and the cool holographic papers ... so glad you joined us at jingle belles. Ooooh I LOVE Christmas cards! LOVE your colours and great icicle punch! Thanks for joining us at CIC31. Its just gorgeous Wendy. Thanks for joining us at LCI this week. What a nice winter card !! I have to agree that the icicles look awesome with that paper you used. I just did a Christmas card too! I have never done one in the middle of summer and it was actually fun and came together nicely. Hope to see you again in our challenge that comes out on the 16th! Beautiful card. Love the pretty blues and the icicles and flower soft look fabulous. Thanks for joining in the Divas by Design challenge. Great card. So glad you could play along with us this week at For Fun. Wendy this is a lovely card, love the icicles, like you I just love the Marianne dies. Cute image and great "fur." Pretty card! Great card. I really do just love those icicles. I am not familiar with the Marianne dies and will have to go check them out! Thanks for the info and for joining us at For Fun Challenges. Thanks for joining us at Emerald Faerie Garden this fortnight! How very pretty. I love the icicles and your image is so sweet! Love the image and your wee take on our Circle Challenge! Thanks for playing in the Sarah Hurley Challenges! This is so sweet. Thanks for joining us at Stampavie and more.